Blake is still passed out on the edge of the cliff as a storm, with fake lightening, is rolling in. Krystle wised up and got a ranger to go look for Blake. Meanwhile, Krystle continues to call for Blake in that awesome walkie talkie. Blake comes to and struggles his way up the hill to get onto the path. Of course, Blake needs to fall the first time - it would not be dramatic otherwise. Unable to stay in the cabin any longer, Krystle decides she is going to look for Blake herself. Well, we all know what is going to happen. Krystle sees a struggling Blake along the path and the two embrace to the theme of the program. I am sure it is safe to say that Blake will not be purchasing the dude ranch. Blake is taken to Memorial Hospital because the hospitals at SkyCrest are not good enough for him. Or this is a way to get Alexis to run into Krystle and Blake. Alexis is at the hospital "supporting" Cecil who is in intensive care - and looking like a ghost. Alexis needs to speak to Cecil, it is her soothing voice that will help Cecil. The doctor relents and Alexis tells Cecil that he cannot die on her - they need to destroy Blake. 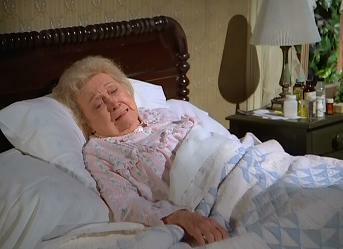 Alexis is also determined to marry Cecil on his hospital bed, if need be. 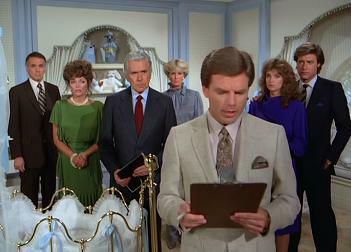 The doctor is opposed to such a wedding and will not allow it until Cecil is strong enough and willing to go through the ceremony. Little Blake cannot be found. The police are able to track down the nurse, Susan, who was heading into town to get a salve for Mrs. Gunnerson's wound. They don't have a first aid kit at the mansion? The baby was not with Susan. Susan, however, is hiding a secret. She has an arrest record as she stole an expensive item back in New York City to try to win the love of Nick Toscanni. Even better, Susan followed Nick out to Denver. Hmmm . . . She gets added to the suspect list. Meanwhile, as Jeff and Fallon grieve, Claudia is hanging about. Alone with Jeff in the nursery, Claudia comes on to Jeff and then tells him that Cecil's heart attack and the kidnapping were God's punishments for what they have done. At least Claudia is less apocalyptic with Fallon and actually shows some compassion. When Blake learns of the kidnapping, he returns to the mansion and is determined to get L.B. back. There will not be a repeat of what happened last time. Alexis hints of a past kidnapping but Krystle seems a little too blonde to catch on. She even asks Blake what had happened and all Blake can tell her is that he does not keep secrets but he cannot talk about it right now. Blake believes Nick Toscanni is responsible for the kidnapping. Things are not looking good for Toscanni as he quit from the hospital (with the administrator calling Toscanni erratic - then why hire him? ), took his files and cleaned out his place. 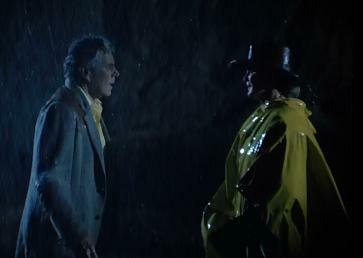 The detective suggests that Blake may have other enemies. Does he ever! Claudia murks up matters at she tells Blake about the bearded man she saw on the grounds. He was in his car and the car had an emblem with arabic writing. Now, Blake suspects that maybe Faruk Ahmed is behind the kidnapping. Whoever is behind the kidnapping had dropped L.B. off at some daycare center and went to retrieve the child. The care taker was expecting a couple but was surprised to only see a single individual who arrived early. Blake is going to flush out the kidnapper by making a televised appeal for the safe return of L.B. During the appeal, Alexis interrupts to talk about the kidnapping of Adam - selfish much? Now everyone knows what Alexis and Blake had been suggesting for the last few months. Even Krystle is not that blonde to realize it. During the appeal, there is this old woman watching it and crying in her bed - Kate Torrance. Her grandson Michael turns off the television and tries to help her. Kate refers to Michael as Adam Carrington. Michael thinks his grandmother is delusional since she is near death. The doctor assures Michael that his grandmother is as sharp as ever. One final note, during Alexis's interruption, she notes that Adam, the oldest child with Blake, was kidnapped 25 years ago. That would make Adam 25, Fallon around 23 (since she killed Roger Grimes at 6-7) and Steven has reversed age again to being about 21 (he was 24 in the first season). Also, Amanda would be holed up in some school at the age of 16-17. I think at this point we have settled the age of the children, but who knows. Alexis: Look, I'm not planning on having a bevy or bridesmaids and a champagne reception, if that's what's bothering you. Doctor: Oh, I see. Forgive me. What you had in mind was just a quiet bedside wedding. Just you, the groom, and a spare tank of oxygen standing by.